Washington D.C., December 7, 2018 - The U.S. and NATO allies worried about losing control of the public narrative of the Cold War in December 1988 after Soviet leader Mikhail Gorbachev’s offer of an arms race in reverse in his famous United Nations speech, according to declassified documents published today by the National Security Archive. Senior Italian officials, for example, complained to U.S. envoy Paul Nitze that the public’s sense of a diminishing Soviet threat would undercut their ability to maintain defense spending – even as the Soviet leader was announcing unilateral troop withdrawals from Eastern Europe. Today’s posting marks the 30th anniversary of Gorbachev’s groundbreaking U.N. speech. In addition to detailed State Department cables reporting on Nitze’s discussions with the Italian prime minister and other top officials, new materials in the compilation describe the U.S. debrief to allies about the Soviet leader’s subsequent short summit with President Ronald Reagan and President-elect George H.W. Bush at Governors Island in New York harbor. A declassified discussion with the Pakistani ambassador shows deep suspicion on the part of a senior State Department official about Soviet intentions and reveals that the U.S. had no strategy for Afghanistan beyond lubricating the Soviet withdrawal. 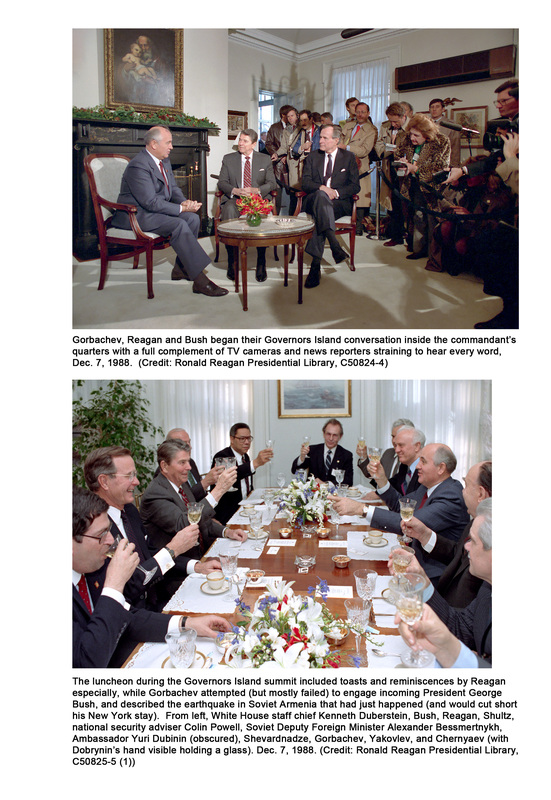 The new documents add to the extensive body of evidence previously published by the Archive, both on the Web in 2008 and in the award-winning book, The Last Superpower Summits: Gorbachev, Reagan, and Bush: Conversations that Ended the Cold War (CEU Press, 2016). 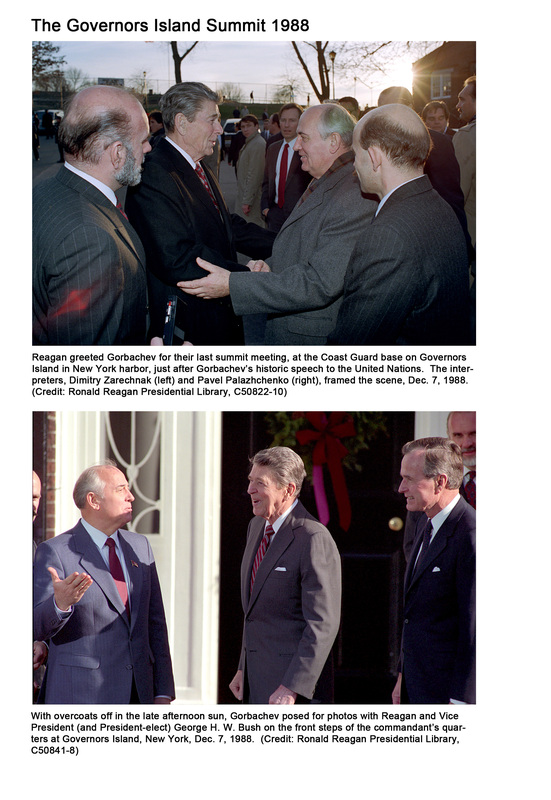 Internal Soviet documentation shows that Gorbachev was prepared for rapid arms control progress leading towards nuclear abolition at the time of that last official meeting with President Reagan, at Governors Island in December 1988; but President-elect Bush, who also attended the meeting, said "he would need a little time to review the issues" and lost at least a year of dramatic arms reductions that were possible had there been a more forthcoming U.S. position. The documentation posted and re-posted today includes highest-level memos from Gorbachev advisors leading up to Gorbachev's speech at the United Nations during the New York visit, notes of Politburo discussions before and after the speech and the Reagan-Bush meeting, CIA estimates before and after the speech showing how surprised American officials had been and how reluctant the incoming Bush administration was to meet Gorbachev even half-way, and the declassified U.S. transcript of the private meeting between Reagan, Bush and Gorbachev on December 7, 1988, 30 years ago. 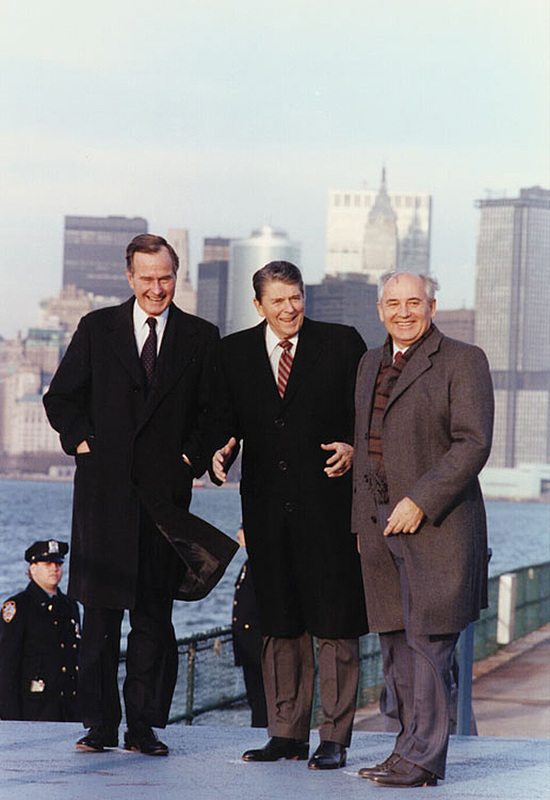 The last official meeting between President Reagan and General Secretary Gorbachev – after four spectacular summits that commanded worldwide attention at Geneva 1985, Reykjavik 1986, Washington 1987 and Moscow 1988 – took place on an island in New York harbor on December 7, 1988 during the Soviet leader's trip to deliver his now-famous United Nations speech announcing unilateral arms cuts and – to many observers – the ideological end of the Cold War. According to evidence from the Soviet side – much of it published here for the first time anywhere – Gorbachev explicitly prepared the U.N. speech as a means to speed up arms reductions, engage the new American leader, and end the Cold War. After the successful signing of the INF Treaty at the Washington summit in 1987 eliminated that entire class of nuclear weapons, the Soviet leadership was prepared for a very quick progress on the strategic offensive weapons treaty START. Building on the personal understanding and chemistry between President Reagan and General Secretary Gorbachev, the Soviets were counting on signing the treaty with Reagan, before the U.S. presidential election of 1988. During the summer of 1988, gradually, the documents show that the Soviet leadership realized that the treaty would have to wait until the new administration came to power in Washington, and therefore, the most important priority for Soviet foreign policy now was not to lose the momentum and to hit the ground running with the new administration. Georgy Arbatov in his June 1988 memo to Gorbachev [Document 1] emphasized the importance of being prepared for the new administration – not slowing down the pace of negotiations, keeping the initiative, and building a base of support in Europe – thus keeping the pressure for comprehensive cuts in conventional arms, including elimination of asymmetries and reductions of Soviet forces by 500,000. However, in the summer of 1988, the Soviet side still saw this plan as part of mutual reductions in Europe. In the summer of 1988, the groundbreaking Soviet XIX Party Conference discussed the main ideas that later became part of the Gorbachev U.N. address and adopted them as guidelines for Soviet foreign policy. But even that significant ideological shift did not produce any response in the United States preoccupied with the electoral campaign. In the fall of 1988, however, after various Soviet initiatives did not result in U.S. engagement, the Soviets felt the need to radicalize their approach if they were to achieve quick progress with the new administration. Former ambassador to Washington and now key Central Committee official Anatoly Dobrynin in his September memorandum to Gorbachev [Document 3] suggested that the General Secretary should meet with the President-elect as early as possible, preferably during his visit to New York for the session of the U.N. General Assembly. Dobrynin suggested that if Gorbachev delivered an address at the U.N., it would be helpful in his relations with the new administration and would have positive impact on the American public opinion. Late October 1988 brought a major break with past Soviet positions, when Gorbachev decided to offer deep reductions in Soviet forces in Europe as a unilateral initiative, and to deliver a major address at the United Nations. Gorbachev conceptualized this speech as an "anti-Fulton, Fulton in reverse" in its significance – comparing it with the historic Winston Churchill "Iron Curtain" speech of 1946 in Fulton, Missouri, at the beginning of the Cold War. Gorbachev wanted his speech to signify the end of the Cold War, offering deep Soviet reductions in conventional weapons as proof of his policy. These reductions would address the most important Western concern about the threat of war in Europe, where the Soviets enjoyed significant conventional superiority. This move, in Gorbachev's mind, would build trust and open the way for a very fast progress with the new American administration. His meeting with President-elect Bush and President Reagan would take place immediately after the U.N. speech. However, the documents show that Gorbachev and his advisers had first to convince their own military of the wisdom of making such unilateral unbalanced reductions, including the problem of what to do with the personnel being withdrawn from Europe [Document 5]. Gorbachev seemed well aware of the potential opposition to his initiative both in the Politburo and in the Armed Forces – a very sensitive issue to handle. The decision making on the U.N. speech involved a very narrow circle of advisers, and the full scope of numbers was never discussed at the Politburo or published, partly because as Gorbachev stated in an unprecedented direct way on November 3, "If we publish how the matters stand, that we spend over twice as much as the US on military needs, if we let the scope of our expenses be known, all our new thinking and our new foreign policy will go to hell. Not one country in the world spends as much per capita on weapons as we do, except perhaps the developing nations that we are swamping with weapons and getting nothing in return" [Document 4]. Gorbachev's U.N. speech on December 7 explicitly endorsed the "common interests of mankind" (no longer the class struggle) as the basis of Soviet foreign policy and, significantly for Eastern Europe, declared "the compelling necessity of the principle of freedom of choice" as "a universal principle to which there should be no exceptions." Gorbachev particularly surprised CIA and NATO officials with his announcement of unilateral cuts in Soviet forces totaling 500,000 soldiers, and the withdrawal from Eastern Europe of thousands of tanks and tens of thousands of troops. Little of this world-shaking impact was evident in the highest-level U.S. government reaction. 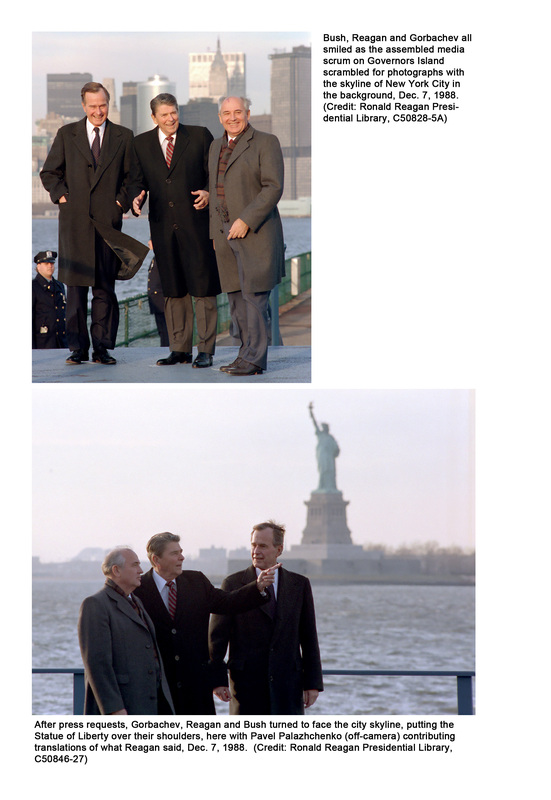 At the Governors Island meeting, for example, President Reagan remarked only that "he had had a brief report on it, and it all sounded good to him"; while Vice-President and President-elect Bush remarked that he "would like to build on what President Reagan had done" but "he would need a little time to review the issues…." Bush described the "theory" behind his "new team" as "to revitalize things by putting in new people." Chernyaev subsequently wrote: "Much has been written about the impression that Gorbachev made on the world in his UN speech. But we also have to consider the impact on him of the world's response to his speech…. Having received such broad recognition and support, having been ‘certified' a world class leader of great authority, he could be faster and surer in shaking off the fetters of the past in all aspects of foreign policy." Regrettably, exactly those "fetters of the past" continued to restrain the highest levels of the George H.W. Bush administration from meeting Gorbachev half-way, and arguably prevented dramatic reductions in nuclear weapons, fissile materials, and conventional armaments, to the detriment of international security today.
. For the inside story on the Navy's shortsighted refusal of on-site verification for SLCMs, see Jack F. Matlock, Jr., Reagan and Gorbachev (New York: Random House, 2004), pp. 277-279.
. See Jack F. Matlock Jr., Reagan and Gorbachev, p. 306.
. The New York Times, 8 December 1988, p. 34.
. For the Moynihan, Goodpaster and other international reaction, see Thomas Blanton, "When did the Cold War End?" Cold War International History Project Bulletin 10 (March 1998), p.184.
. George Bush and Brent Scowcroft, A World Transformed (New York: Alfred A. Knopf, 1998), p. 46.
. Jack F. Matlock, Jr., Autopsy on an Empire (New York: Random House, 1995), p. 177; Anatoly Chernyaev, My Six Years With Gorbachev, p. 201.
. Anatoly Chernyaev, My Six Years With Gorbachev (University Park, PA: Penn State University Press, 2000), p. 203.